I have opened my Etsy shop back up. A good friend of mine helped me get over the fear of it. There are only 3 items listed at the moment, but I hope to be able to add more soon. 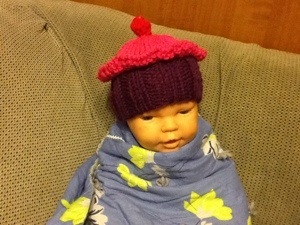 I love the yarn family singers, they always make me laugh. My birthday wasn’t very exciting this year, but it was a good day. I received a text from Ranna, a card from Britta and her fam, calls from my side of the family that I missed because I left my phone down stairs and at home while we were out. When Eric was leaving, he gifted me with this. 8 oz of bare Blue Faced Leister roving. Amy I have something to dye when you get here. 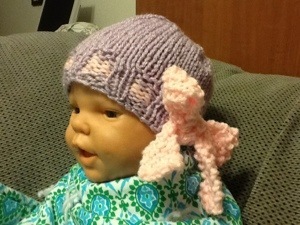 Emma also picked out something. I finished a project just in time for the Market on Sat. When Eric got home we went to coldstone to use my free coupon. We took Justin alone because he and Emma had a bet that who ever got their rooms cleaned faster the other would have to buy them Ice Cream. Emma won. We all went to wal-mart to pick up vanilla pudding for the Amish Friendship Bread, which I will be taking to knit night. After dropping Justin off we went to Sam’s club where I spent the money Britta gave me. After Sam’s club we ran over to Borders to use my birthday coupon on Eric’s book. On the off chance of something good in the knitting section, I took a look. Justin’s birthday money bought me this. I have been obsessed with socks lately and what could be better! When we got home we unloaded the car, made the Amish Freindship cakes. I doubled the recipe so I did 2 cakes instead of bread. Then we made dinner and watched Twilight. We picked that up at Sam’s club too. 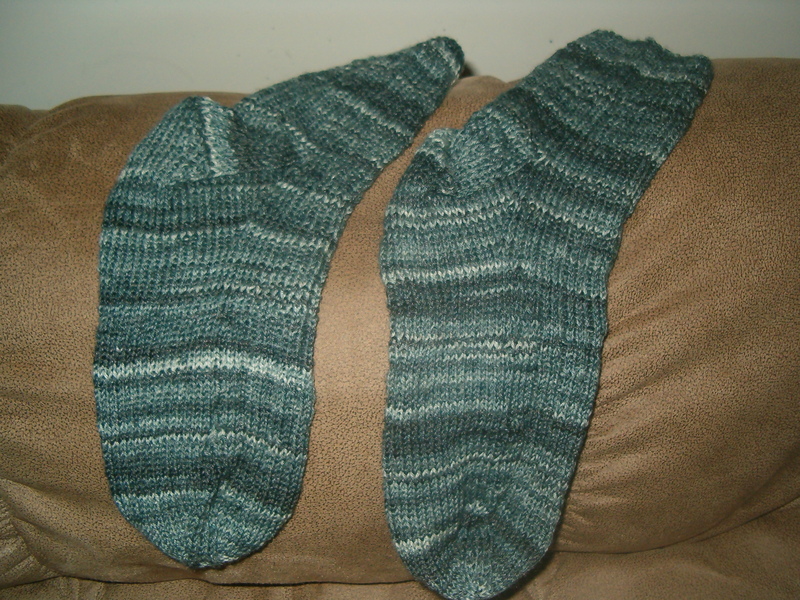 I finally finished Eric’s socks! I started them back in July. Socks never take me this long! He has size 11 feet. I finished them last night, but I wouldn’t let him wear them until I get to parade them around spinners and knitting night. I have to show proof that I finally finished them. Can I throw a tantrum too! Emma decided to throw a tantrum just now. She got all her toys taken away and her books, and the playroom for 2 days and coming downstairs for game night. I am at my wits end. I have no clue how to get her to stop. nothing phases this kid. If we get put on time out we scream, if we get things taken away we scream. Any ideas? I am wound up so tight that I want to throw a tantrum too. Good thing I get to go to the yarn shop in a few hours. Sorry Tina, your shawl pattern might get the brunt of my frustration. 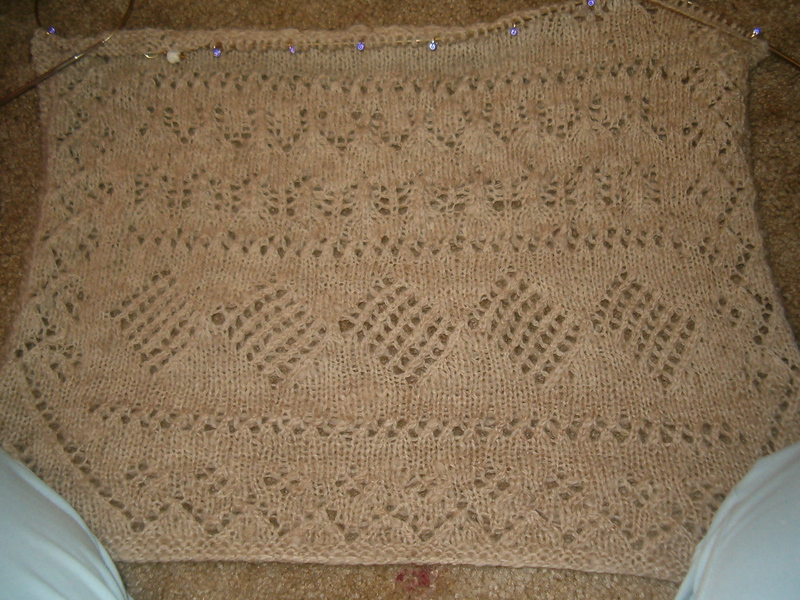 By the way, the shawl is progressing very well. Though I did have to fudge it again. I promise not to touch it until knit night when I have had some time to calm down. Emma actually let me do her hair today and I felted her clogs. Don’t tell her that they are for her, they are a christmas present and she still hasn’t figured it out.